We, the Friends of Newton Centre, support a vision and plan that preserves the scale and unique character of the historic village of Newton Centre. We desire a village center that is green, accessible and pedestrian-friendly, safe, clean and devoid of traffic and parking problems so that residents and visitors may fully enjoy the residential and retail environment. This is our mission - please join us. Help Save the Newton Centre Branch Library! The Newton Centre Branch Library is now in danger. The city has begun a process that may result in the loss of the building to the citizens of Newton. Please tell your elected representatives to revers the surplus status and retain the building for the use of the community and to preserve this beautiful and historic building. Newton Centre needs a community space! keep you updated as we try to save the NCBL. This building, located at 1294 Centre Street, Newton Centre, is listed on the National Register of Historic Places. Friends of the Newton Centre Branch Library is a group supporting the restoration and reuse of this beautiful building. We do not support the city's plan to sell the building off. We wish to see the city retain public ownership of the building by the citizens of Newton, as originally intended by the citizens of Newton who paid for and built it. 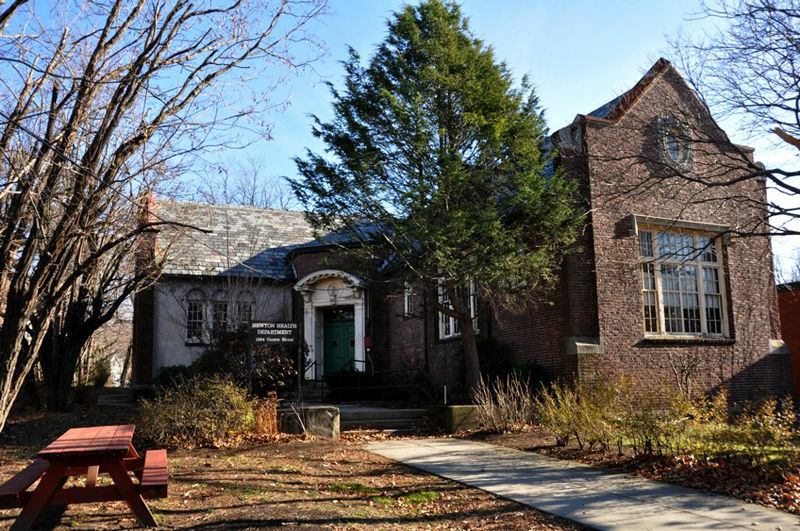 We would like to see the building restored and used as a Community Space for the people of Newton Centre and others, the same way the villages of Waban, Newton Highlands and Auburndale have already done with their branch libraries. The Newton Centre Branch Library, built in 1927, was funded and built exclusively by a group of residents from Newton Centre. It was a gift to the city from the 2,300 citizens who raised the funds, hired the architect and builder, and provided books and furniture. (Other libraries in Newotn were built by the residents including Waban, Newton Highlands and Auburndale.) Their intent was to provide a space located right in the village of Newton Centre for a reading room, children’s programs, lectures, classes and other community activities and it served this purpose well for many years. Located at 1294 Centre Street, the building is listed on the National Register of Historic Places and would qualify for Newton Landmark status according to the Newton Historical Commission. The residents of Newton Centre wanted a useful and also beautiful space to be built. Located on a portion of park land called Newton Centre Green, the building is a fine example of Tudor Revival style with a slate root and the interior has colorful painted stenciling on the walls and ceiling, carved wooden moldings and a stately fireplace in what was once the Reading Room, panelled doors and distinctive fixtures and many other beautiful details which are still in fine condition. It was designed by notable Boston architect James H. Ritchie of Ritchie, Parsons and Taylor (who also lived in Newton). Ritchie designed the many notable buildings in Massachusetts and throughout the Northeast. It is a beautiful building and is part of an important civic movement. The library was closed in 1990 when the new Main Library was built and was then occupied by the Newton Health Department. Although the city has allowed it to deteriorate significantly, the building could be restored to its original dignity and purpose if there are people who are interested in seeing that happen. To this end we are supporting its use by MassChallenge. The city has stated that there would be meeting space that Newton Centre community groups could utilize and opportunities for the Main Newton Library to hold events there. The preservation of the building is considered to be HIGH PRIORITY by the city, by the state of Massachusetts and by the CPC. The CPC funded a plan for this purpose. This plan should be implemented as soon as possible. Rather than lying empty, which it has since 2012, we believe it would serve the building and the community if it were used in the interim - with the caveat that there is community access during that time, and that the exterior and the interior features need to be preserved and maintained. "NewtonMA NewtonCentreBranchLibraryBuilding" by User:Magicpiano - Own work. Licensed under GFDL via Wikimedia Commons. © 2015 Friends of Newton Centre. All rights reserved.